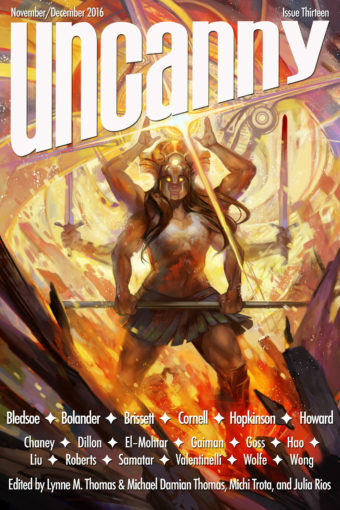 Welcome to Uncanny Magazine Issue Thirteen! All of the content will be available for purchase as an eBook (PDF, EPUB, MOBI) on November 1, 2016. The free online content will be released in 2 stages—half on November 1, and half on December 6. Featuring all–new short fiction by Paul Cornell, Brooke Bolander, Jennifer Marie Brissett, Alex Bledsoe, Kat Howard, and Nalo Hopkinson, reprint fiction by Amal El–Mohtar, nonfiction by Alyssa Wong, Monica Valentinelli, Navah Wolfe, Tansy Rayner Roberts, Keidra Chaney, and Hao Jingfang (translated by Ken Liu), poems by Neil Gaiman, Theodora Goss, and Sofia Samatar, interviews with Jennifer Marie Brissett and Alex Bledsoe, and Julie Dillon’s “Impact Crater” on the cover. Episode 13A (November 1): Editors’ Introduction, Paul Cornell’s “Don’t You Worry, You Aliens” as read by Heath Miller, Brooke Bolander’s “Our Talons Can Crush Galaxies” as read by Erika Ensign, Theodora Goss’s poem “Rose Child” as read by Amal El–Mohtar, and Brooke Bolander interviewed by Deborah Stanish. Episode 13B (December 6): Editors’ Introduction, Kat Howard’s “The Green Knight’s Wife” as read by Erika Ensign, Nalo Hopkinson’s “Can’t Beat ‘Em” as read by Amal El–Mohtar, Sofia Samatar’s “Blue Flowers: Fragments” as read by Amal El–Mohtar, and Tansy Rayner Roberts interviewed by Deborah Stanish. 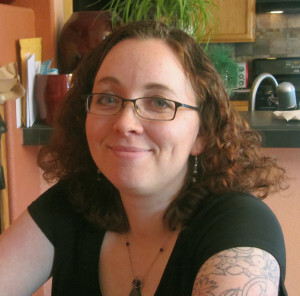 Julie Dillon is a Hugo Award–winning artist living in California. She has had a lifelong love of fantasy and sci–fi art and literature, and is excited to be making her own contribution to the field. Over the years, she has worked on book covers, magazine illustrations, gaming illustrations, and a variety of other commissions, and she is currently working on branching out into creating more of her own work. Her website is www.juliedillonart.com and you can follow her on Twitter at @juliedillon.